The mission of the Blanco Library is to provide open access to information and to promote literacy, love of reading, and lifelong learning opportunities for all members of the community. The Blanco Library seeks to inspire intellectual and cultural curiosity in a neutral and safe environment, while building partnerships and responding to the needs of our diverse community. The Blanco Library was founded by the Blanco Woman's Club on October 12th, 1938. Mrs. Maude Chick was the Blanco Woman’s Club president and Mrs. Elmer Dale was the chairman of the library committee. The ladies raised funds through their first Silver Tea for the library. Mr. Robert Fulcher provided the shelf space and a reading table in his drug store (now Strickland's Drug Store). The library officially opened November 19th, 1938 with the 400 books that the Texas State Library loaned as a starter collection. For 47 years the Blanco Library received no public funds and was mainly supported by a per capita assessment from the membership of the Blanco Woman's Club plus fundraisers such as bake sales, cake walks, luncheons, and book sales and private donations and memorials. The ladies auxiliary of the Fraternal Order of the Eagles helped develop the collection by providing several grants for the purchase of large print books. On April 27th, 1976, the Woman’s Club filed to create the Blanco Library, Inc as a non-profit, 501(c)(3) corporation, so that donations given to support the library were tax deductible. After a series of moves, in 1988 the Library was able to purchase 310 Pecan Street on the square due to a legacy from James A. Williams. Mr. and Mrs. Williams left their home and property in their will, stating that the library could use the home for a new location or sale the property to purchase or build another library. To honor their memory, the library was renamed the James A and Evelyn Williams Memorial Library. Later, the library purchased the adjacent building and expanded to have a children’s room. The library was given the property at 1118 Main, which had been a restaurant. After a fundraising effort from members, the local community and some foundations, the restaurant building was expanded to a 3,800 square foot building. The proceeds from the sale of the building on the square were also used toward construction. 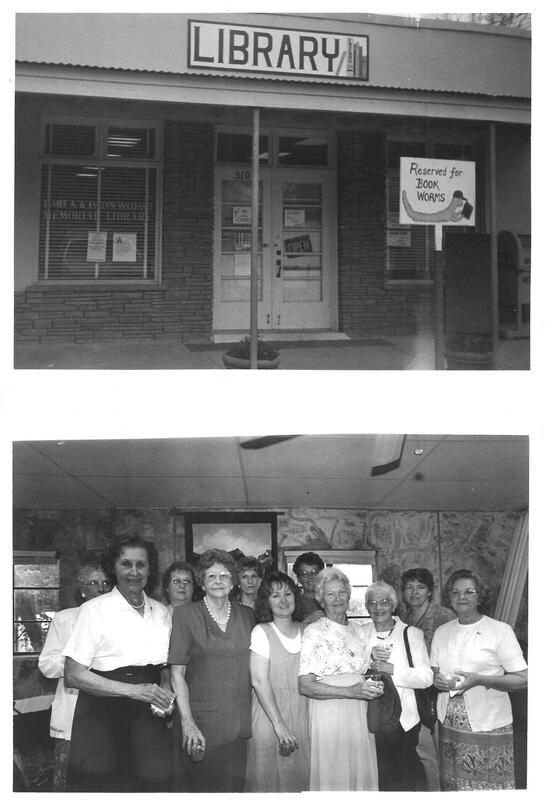 The grand opening at the new location was April 2000. The librarian, Sandra Paine, was still a volunteer (she received $1 a year in salary which was donated back to the Library). When Texas passed laws allowing for Library Districts, an election was held to form Blanco County South Library District: Precincts 1 and 4 in Blanco County, excluding the City of Blanco. The law allows one half of one percent of sales tax in this District to be used for operation of the Library. In February, 2002, Blanco Library, Inc. transferred operation of the Library to the District. Blanco County now contributes $5,000 per year and the city of Blanco contributes $12,000 to the Library District for operation. Taxes collected from sales are not enough to operate the Library to this day. The library obtains grants for specific projects such as expanding the number of computers, presenting special programs, or purchasing equipment. There is a paid Librarian, an Assistant Librarian, and a few part-time library aides. Mildred Doran, an early member of the Woman’s Club, willed the library assets that only the interest could be used for Librarian’s salary. Staffing is still mainly accomplished by about 30 volunteers. The Friends of the Blanco Library raise money to support the library through membership dues and other activities. The money purchases the books for the library, provides periodical subscriptions and programs, as well as help to fund a variety of special events and needs. Blanco Library Inc. still maintains the Library through funding from the dues of members of the Blanco Woman's Club, their annual Silver Tea, private grants, and generous donations. Inc. Board members contribute their time as do members of the Boards of the Blanco Library District and the Friends of the Library. In 2016 the three boards of the Blanco Library completed fundraising for expanding the building. The expansion and renovation created a new large conference room, small conference room, two study rooms, a reading room, a kitchen, storage, and a computer lab. The library was expanded by half again the size it was in 2000. To serve the needs of the growing population and increasing use of the library, we began planning for the future. Land has been purchased for a new building and plans drawn. Due to the downturn of the economy, fundraising efforts for the new building have been put on hold. Even in poor economic times, the library continues to serve the City of Blanco and the surrounding community. Blanco is a farming, ranching, tourist area north of San Antonio and west of Austin in the lovely Texas Hill Country on the beautiful Blanco River. The library serves a population of 6,000 people in the south half of Blanco County and additionally serves surrounding communities of Spring Branch, Kendalia, and Henly. Facilities include a large general collection area, areas for children and youth, a genealogy room, computer areas for both children and adults, and a spacious public meeting room with kitchenette. The Blanco Library strives to provide library materials and services to support the informational, educational, and recreational needs of the Blanco citizens and community. We have a collection of over 26,000 materials, including best sellers, a large selection of children's books, videos, audio books, and more. Visit our rare Texana Collection, Genealogy books and documents, and the classic South Western Journals collection. Also you can access Resource Libraries of Texas, the USA, and the World by using our Internet computers!